The Blue Line originally terminated at Court Street Station in Downtown Boston. 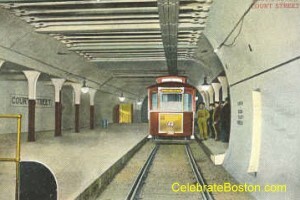 The line, then known as the East Boston Tunnel, was later extended to Scollay Under in 1916, and then to Bowdoin Square. Court Street was a single track "dead-end" station, meaning the streetcar conductors would observe a traffic signal, then crossover to the other track and enter the station. After stopping, the conductor would reverse the electric trolley pole, and change ends and operate the streetcar in the opposite direction. The design was dangerous, and at least two conductors were crushed to death between cars in the station during rush hour. When the tunnel was extended to Scollay Under (Government Center), the walls and platform of old Court Street Station remained for many years, as the extension was cut under the old station. When leaving State Station in the westbound direction today, the tracks elevate significantly and then drop down into Government Center, under the location of the old station. About the abandoned station, in 1976, a painted sign labeled "Court Street" still remained on the north wall, but did have a large hole in it from an old concrete excavation. There was also a painted sign that mandated "Do Not Smoke Here." 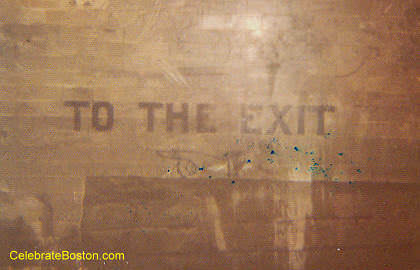 On the south side of the station, there was a painted sign that said "To The Exit" with a hand pointing to the stairway that led to the entrance. The old platform walls were attached by a concrete beam, and the Blue Line cars used to run visibly right under the abandoned platforms. There used to be a small steel grate on Court Street that marked the spot where the station kiosk was. I do not believe the passageway from Court Street to Scollay Upper (Green Line level still exists, or was bricked up many years ago.